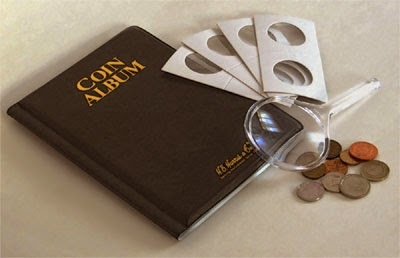 When your coin collection is small, it is easy to keep track of what coins you have using your memory alone, a notebook, or even just a piece of paper. But as it gets bigger, you're not going to be able to remember exactly which coins you have, and trying to look in your notebook for a specific coin is going to get more and more difficult. One option when your collection grows this large is to keep track of your coins in a spreadsheet program like Microsoft Excel (Google Docs and OpenOffice.org are free alternatives). Create a spreadsheet with a column for each piece of information you want to track (year, country, denomination, condition, etc.). This lets you easily add new coins anywhere in the list, and sort your list by whichever columns you want (such as by country then by year). Coin pictures. These sites have pictures of thousands of world coins, so that you can see what your coins look like without pulling out your collection. Pictures can also help you more easily locate a coin that you need to track in your collection, or make sure that you've identified the coin correctly. Complete coin listings. A spreadsheet shows you what you have, but the coin collection Web sites list all coins for all countries. This lets you see which coins you don't yet have and might want to get. You can see which denominations were minted for a particular year, or see when a coin changed its design, or see what kinds of special or commemorative coins exist for a country. Access your collection from anywhere. Because your collection is tracked online, you can look at it from anywhere you can get access to the Internet - home, work, school, the library, etc. If you have a smartphone (iPhone, Android, etc.) or tablet computer with Internet access, you can even check, or update, your collection from anywhere. This is especially handy when you're at a coin shop or show, and need to know what you already have. Want lists and trade lists. Many collection sites let you keep track of extra coins that you have to trade (a "trade list") or coins that you are looking for (a "want list"). Facilitate trading. Because these sites have lots of people using them, you can use your want and trade lists to find people who either want a coin that you have, or have a coin that you want. You can then use the messaging features of the site to arrange a trade. Some sites also let you rate people who you trade with, so that untrustworthy traders can be pointed out. Import and export lists. Many of the sites allow you to import your current list of coins, if you are already keeping track of your coins in a file or spreadsheet. You can also export your online collection to a file/spreadsheet so that you have a backup on your computer (in case your Internet connection stops or the collection site shuts down). This also lets you switch collection sites more easily - if you find a site you like better, you just export your list from the old site and import it into the new site. Search. Most sites allow you to find a coin by either browsing (clicking on country names and years) or searching (typing in information about a coin, like the country, year, and amount). When you are entering coins into your collection, using search is faster than the click-click-click required by browsing for the coin. Mapping your collection. A few sites can show you a map of the world, with the countries that you have collected colored or highlighted. I think this is an especially fun way to look at your collection. If you have a large collection and haven't been keeping a list of your coins in a spreadsheet already, it can take quite a while to get your collection fully entered into a collecting site. But it is definitely worth the time because your collection will be much easier to keep track of when it's done. My current favorite site is Numista. Its searching ability is great (you can search for "2005 mexico 5 pesos" and it finds the right coin), the search results shows pictures of each coin, and it even shows you which coins are already in your collection. You can also browse by country, denomination, and year to find coins. Numista has a fun map that shows countries in different colors based on how many coins you have. You can mark which coins you want to trade, and when you are looking at a coin it will tell you who has one they'd like to trade. You can even add missing coins (or new coins that haven't been added yet), or add pictures for coins that Numista doesn't have. Numista doesn't let you create a "want list", and its automatic saving of the coins you select sometimes doesn't work - so definitely double-check that it has properly added your coins. Numista does have the ability to import and export coin lists, so if you start there and don't like it you can always take your coin list somewhere else. Update October 2013: Numista now has the ability to create a "wish list", so that you can keep track of which coins you are searching for. This also helps other users trade with you, because if you have a coin that they want they can see the coins that you want. A collection Web site is a great way to track and manage your coin collection (some, like Colnect, can also track other collectibles like paper money or stamps). If the site you start using can export your collection to a file, make sure to do this regularly. That file is your backup list of your coins, in case the collection site closes or your Internet connection is down.